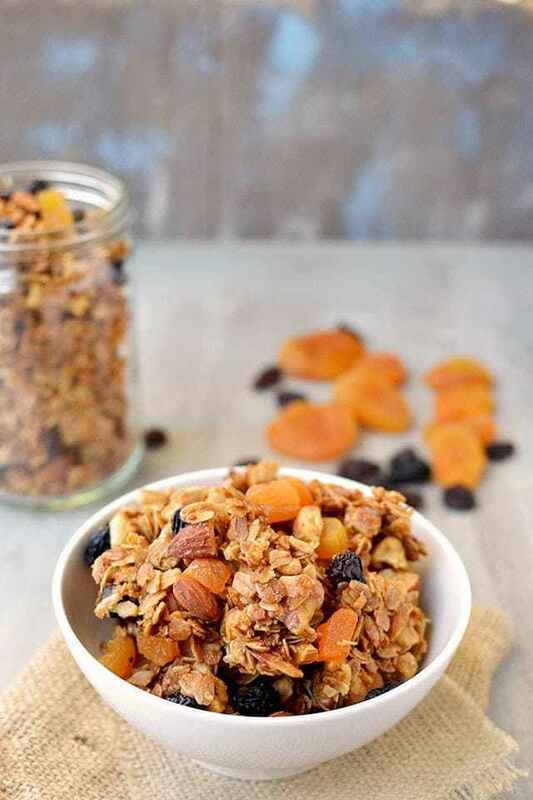 Crunchy and delicious Granola recipe with a California twist. Preheat oven to 300°F. Lightly spray a rimmed baking sheet with cooking spray or brush with canola oil. In a large mixing bowl, combine oats, almonds and walnuts. In another medium mixing bowl, combine honey, sugar, maple syrup, olive oil, canola oil, vanilla extract, cinnamon and salt. Whisk well to combine. If you see that the honey seizes and refuses to dissolve, then gently heat the mixture until it dissolves (make sure that the bowl is heat sensitive -- otherwise transfer the contents into a saucepan). Add the wet ingredients to the dry and mix well till combined. Turn the mixture onto the prepared baking sheet and spread into an even layer. Bake, stirring and re-spreading the mixture into an even layer every 5 minutes, until the granola is light golden brown, about 45 minutes. Remove the baking sheet from the oven and stir in the dried apricots and raisins/ dried cherries and spread the granola evenly in the pan. Packing the granola down onto the baking sheet will allow it to cool as a big cluster which can be broken into smaller clusters later. Set on a wire rack and cool to room temperature. Break up into clusters and store in an airtight container.